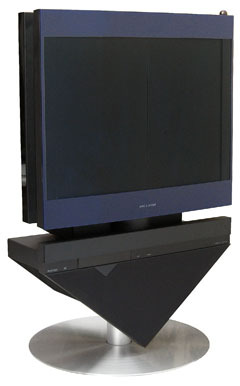 The Beosystem AV 9000 was B&O’s first complete “home cinema” system, comprising audio and video sources with a surround sound processor, a large screen monitor and five loudspeakers. Text copyright © Beocentral. Unauthorised reproduction prohibited. The complete system was made up from the AV 9000 Monitor, the Control Center, the stand, the Control Center VTR video recorder, the Master Panel AV 9000 (similar to a Beocenter 2500), one pair of Beolab 8000 loudspeakers and one pair of Beolab 6000 loudspeakers. Text copyright © Beocentral. Unauthorised reproduction prohibited. The complete setup was very expensive, costing as much as a decent family car in the UK. Despite being state of the art when new, the home cinema field was a fast moving one at the time, and the setup became quickly outmoded by innovations such as 16:9 aspect ratio TV sets, DVD players and Dolby Digital surround sound. Text copyright © Beocentral. Unauthorised reproduction prohibited.